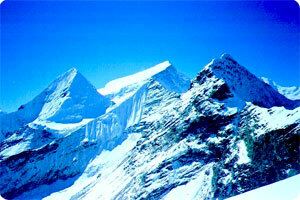 Churen Himal trekking is non touristy trekking trail in Annapurna region. Since Churen Himal trekking trail has been open Himalaya Journey Treks & Expedition has depth experience for operate Churen Himal trekking and climbingChuren Himal Trekking is completely apart from the beaten paths, this trekking is for the person who love the beauty of nature, the wild valleys, Himalayan scenery. Churen Himal trek will take you out of the beaten track inside a region where very few foreigners are traveling, reaching the Churen Himal base camp, a peak belonging to the western Dhaulagiri range. As Churen Himal trek is non touristy area , you will get chance to explore the new trekking experience in Nepal. Be-part from Beni will lead you to the foot of Churen Himal. Walk across Myagdi khola until Sibang to cross Jalja la (3430m) Dhorpatan and of the hunting preserve Gurjaon and Beni drunk of return to Katmandu. Himalayan sights: Churen Himal,Annapurna Himalaya range, (I,II,III,IV), Machhapuchhre Himal, Manaslu Himal, Dhaulagiri Himalayan range, Fishtail mountain, Lamjung Himal, Hiunchuli etc. Day 01: Arrival in kathmandu 1334m, transfer to hotel , Churen Himal trekking briefing with officially arrangements. overnight at kathmandu hotel. .
Day 02: Drive to Beni or (Flight to Pokhara) & over night at Beni Camp. Day 03: Beni to Bhabichaur. Day 04: Bhabichaur to Dharapani. Day 05: Dhrapani to Lamsung. Day 06: Lamsung to Jaljala bhanjyang. Day 07: Jaljala bhanjyang to Gurjaghat. Day 08: Gurjaghat to Rupachaur. Day 09: Rupachaur to Gurja Gaun. Day 10: Gurj gaun to Lamsung. Day 12: Khibang to Malkapang. Day 13: Malkapang to Pakhapani. Day 14: Pakhapani to Beni. Day 15: Beni drive to Pokhara and flight /drive back to to Kathmandu. Day 16: After breakfast, our tour guide will take to for historical monuments sightseing in kathmandu valley such as Bhaktapur, Pasupatinath, Boudhhanath, Kathmandu durbar square and Monkey temple(swyambhunath) and in the evening farewell dinner in Restaurant, overnight at kathmandu in Hotel. Day 17: After breakfast, Relaxing/shopping with own activities than drop to Kathmandu international airport for onward journey.